Is teeth polishing really necessary during a dental cleaning? Good question. After tartar has been removed from the teeth, teeth are usually polished using paste and a rubber cup attached to a motorized handpiece. The dental polishing is done to remove the film of bacteria on teeth and any surface stain caused by substances like tea, coffee, berries, dark dressings, wine and/or a smoking habit. So, while polishing is part of the routine dental cleaning process, it should be based on the client’s individual needs. That said; factors such as cavity/ tooth decay risk, presence of demineralized enamel, enamel erosion and abrasion, gum recession and the type of staining present should always be evaluated. Interestingly enough, there have been some concerns about this. But according to Dr. Frantsve Hawley, a registered dental hygienist with a PhD in biological and bio-medical sciences; “having your teeth polished twice a year, even with the coarsest paste, is not frequent enough to cause significant damage to enamel”. I’d agree that there’s to worry about here! In fact, using a medium to hard bristle toothbrush, or brushing too aggressively is what can undeniably cause damage to the teeth in the long term, leading to recession of the gums and tooth abrasion. Furthermore, diets high in acids and sugars can lead to enamel demineralization and erosion. Pina Mazza always polishes teeth with care! 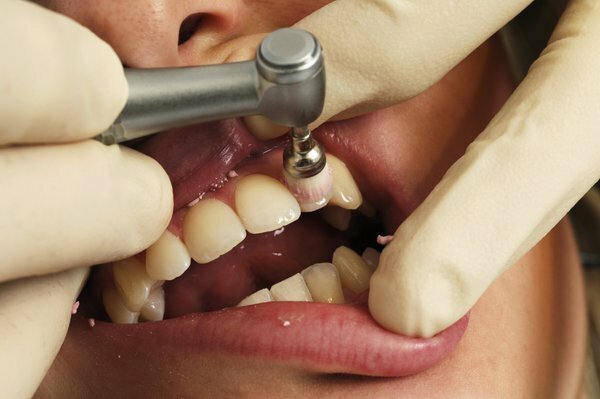 Oral health care professionals should always practice safe polishing techniques. The pressure and speed of the rubber cup against the teeth during a dental polishing should be kept to a minimum, thereby preventing any potential tooth abrasion and/or sensitivity. The quality of the polishing paste should also be a very important consideration. A fine grit paste with fluoride is best. Medium and coarse grit pastes should only be used in situations where there is significant staining. Scaling teeth to remove tartar is the most important part of a dental cleaning and has the most oral health and overall health benefits. Dental polishing can ultimately be considered the finishing touch of the dental cleaning appointment, and is essentially done for cosmetic purposes. By removing the film of bacteria on each tooth, polishing leaves the teeth feeling super smooth and clean! What’s not to love about that? Due for a thorough, gentle cleaning? Maple Dental Hygiene Care’s friendly and experienced dental hygienist Pina Mazza is happy to help with all your oral hygiene care needs. Contact Pina today to schedule a visit! The Truth about Fluoride in Our Water →← Why Are Professional Dental Cleanings so Important (and Necessary)?